You're already struggling with bills you can't pay. And now a debt collector is on the other end of the phone, demanding that you come up with the cash. And if you don't, that debt collector sure makes it sound like a lot of terrible things could happen to you. But here's what you might not know: The federal government, through its Fair Debt Collection Practices Act, gives you certain rights. If the collection agency calling you violates any of them, you can report it to the Federal Trade Commission or your state's attorney general. The debt collector calling you might not share this information with you. Just like it might keep other debt-collection secrets to itself. Here are five secrets that collection agency doesn't want you to know. Tired of receiving calls from a collection agency? You can stop them by writing the agency a letter requesting that they refrain from contacting you in the future. Debt collection agencies are required by the Fair Debt Collection Practices Act to honor such a written request. Be aware, though, that the debt you owe still exists. And if you don't pay it back, collection agencies are allowed to take legal action — they can sue you — to force you to pay up. If a collection agency does decide to take legal action, it is allowed to contact you to let you know, even if you've written a cease-and-desist letter. Collection agencies prefer that you come up with all the cash that you owe at once. If that's not possible, these agencies will seek the biggest possible payment that you can afford. But you can request a repayment plan that works within your budget. Negotiate with collection agencies to work out a smaller monthly payment, one that won't drain your bank account. Collection agencies aren't required to accept a payment plan. But it never hurts to request one, and many debt collectors understand that an affordable monthly payment plan is often the best solution. Under federal law, debt collectors are not allowed to call you several times a day or at odd hours. 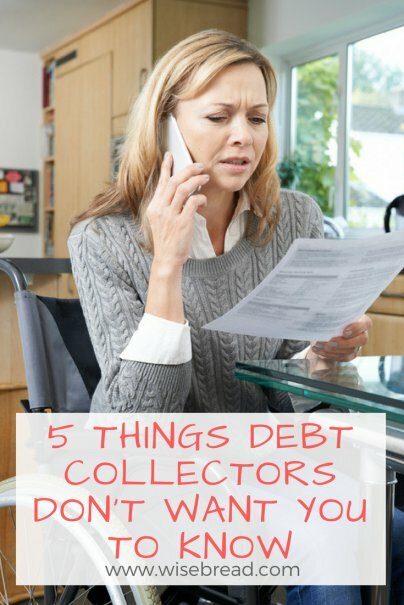 This is a bit vague, but collectors shouldn't be calling you five times a day or ringing your phone at 4:00 a.m. Debt collectors also can't call you at work if you request that they not do so. And debt collectors can only contact your neighbors, family members, friends, or coworkers to find your current address or phone number. The Fair Debt Collection Practices Act forbids them from talking to other people besides you and your attorney about your debt. The United States does not throw people in jail because they owe money. There is no debtors' prison here. So, debt collectors can't say that you'll end up in prison because you owe money. Debt collectors also can't threaten to sue you unless they actually do plan to begin legal action against you. Federal law also forbids collectors from using threatening or profane language when trying to collect a debt. Collection agencies have to follow certain guidelines when trying to collect unpaid debts. One of the biggest? Within five days of contacting you about an unpaid debt, the agency must send you a written notice stating how much you owe and the name of the creditor that is seeking the money. The letter must also spell out the steps you can take if you don't believe you owe this money. You can also request that a debt collector verify any debt that you owe. Collectors can't make any additional phone calls until they send you a written letter verifying that you do indeed owe what your creditor claims. Only after sending this letter can a debt collector resume contact with you. It's easy to feel overwhelmed when a debt collector calls. But don't forget your rights. Be sure, too, to let debt collectors know that you understand your rights and that you will take action if the collector violates them. Have you ever been pestered by a debt collector? How'd you get them to stop?